BBC NEWS | Middle East | Why did Israel attack USS Liberty? 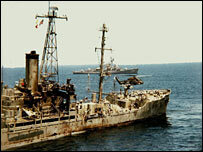 Why did Israel attack USS Liberty? For former US seaman Gary Brummett, the 40th anniversary of the 1967 Middle East war has stirred painful memories. 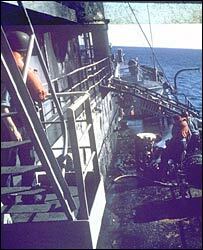 As a 21-year-old third class petty officer, Mr Brummett was serving on board the USS Liberty off the coast of Egypt on 8 June, when, without warning, the vessel came under fire, first from fighter planes, then torpedo boats. The attack, which lasted at least 40 minutes, resulted in the deaths of 34 of Mr Brummett's fellow crewmen, at least 170 injured and catastrophic damage to the ship. Alarmingly, the assault had been carried out not by enemy forces, but by the US' closest regional ally, Israel. Israel insists it mistook the Liberty for a hostile Egyptian ship, the El Quseir, and numerous US and Israeli inquiries have concluded the attack was accidental. But for Mr Brummett and a growing body of conspiracy theorists, the authorities are guilty of a cover-up. "I have more trouble with it today than when it happened because I know more of the facts about what was going on," said Mr Brummett. "There's been an egregious wrong done here, there's been an extreme number of lies told to the American people and the American people do not know the truth about what happened." The attack on the Liberty - the gravest incident in the history of US-Israeli relations - has been a source of controversy for the past four decades. Claim and counter-claim as to what happened have been fought out in every corner of the media, with the advent of the internet helping to reinvigorate the debate. Israel's supporters say the incident is merely being used as a tool by critics to malign the Jewish state, while accusers say the attack was a war crime which has never come to light. According to Israel, the incident was a tragic case of friendly fire occurring in the fog of war. It says it believed the ship had been bombarding Israeli forces fighting in the Sinai, and that its pilots did not see any US flags (survivors say there were three) on the vessel before they opened fire. Sceptics however claim the attack was premeditated and that the truth has been suppressed. The assertion of a cover-up was lent weight by a 2003 independent commission of inquiry which reported that the attack on the Liberty "remains the only serious naval incident that has never been thoroughly investigated by Congress". Among the most popular theories as to why Israel would take such drastic action against its superpower ally is that the Liberty, a $40m state-of-the-art surveillance ship, was eavesdropping on an Israeli massacre of Egyptian prisoners of war. Israel strongly denies its troops executed Egyptian POWs, saying those who died in an incident at that time were 250 armed Palestinian fighters killed in action. Another is that the ship had learnt of secret Israeli plans to invade Syria's Golan Heights two days later and had to be destroyed. Perhaps the most sinister motive is that put forward by journalist Peter Hounam in his 2003 book "Operation Cyanide". Mr Hounam claims secret elements within the US and Israeli governments colluded to bomb the ship and blame the attack on Egypt and their superpower ally, the Soviet Union, triggering massive retaliation which would ensure Israeli victory. "The attack on the Liberty was pre-planned, perhaps from at least a year beforehand," Mr Hounam says. "The Liberty was sent into a very dangerous situation, where it was, in my view, placed in a position to be attacked." Mr Hounam says the intention was to sink the ship and kill everyone on board, but as the Liberty remained afloat the plan was aborted and has been hushed up ever since. Successive US and Israeli inquiries, and the declassification of thousands of pieces of information, have done little to dampen suspicions. One of the most powerful claims of a cover-up has come from retired US Navy lawyer Capt Ward Boston, counsel to the Navy Court of Inquiry into the incident conducted just days after the event. Capt Boston says the court's original findings, which he signed, were changed afterwards by government lawyers. He also claims the president of the court, Rear Adm Isaac Kidd, told him he was ordered by US President Lyndon Johnson and Defence Secretary Robert McNamara to conclude the attack was a case of mistaken identity. However, Capt Boston's version of events - and the notion that what happened was anything more than a tragic accident - are disputed by numerous academics and authors who have investigated the incident. "It was a series of blunders by both the United States and Israel that resulted in a terrible tragedy and nothing more," says Jay Cristol, a federal judge and author of the book The Liberty Incident. "All the official reports came to the same conclusion. "Unfortunately there are a number of people who are on the other side of the Arab-Israeli conflict who think this is a way to attack the otherwise very strong relationship between the US and Israel, and they keep stirring the pot. It is a view with which historian Michael B Oren, a senior fellow at the Shalem Center, a Jerusalem academic research institute, concurs. "Many thousands of documents related to the Liberty have been declassified and in none of these documents will you find a scintilla of evidence to suggest any of these conspiracy theories are true," he says. "The Golan one is the easiest to disprove because of where the Liberty was, not off the coast of Israel, but Egypt. Its listening devices weren't that powerful that they could listen in on communications in Tel Aviv. "Moreover the Israelis were very upfront in telling the US that they planned to capture the Golan Heights and the Americans agreed to it. "Regarding a massacre of Egyptian POWs, there's no evidence of that. And why would the Israelis try to cover up one atrocity by committing another? He says the attack has remained a source of controversy because "it has all the ingredients of a good spy scandal. It involves espionage and it involves the Israelis, who are forever a focus of conspiracy theories. "If I could prove the Liberty was attacked in a premeditated fashion, I would write it - it would be a great historical scoop - but the truth is far more mundane." How can the legacy be resolved?